On this full-day tour, your experienced guide will drive you everywhere in Paris to see the main monuments and the most famous museum in the world. 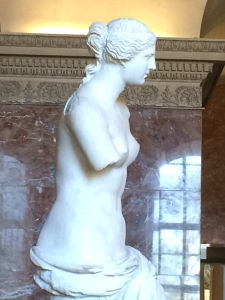 Your guide will share with you his knowledge and experience, and lead you to the best places in the museum to see the Venus de Milo, the Mona Lisa and so much more … The purpose of this tour is for you to see the highlights of the Louvre and to give you the best overview of the city. Your Licensed English-Speaking Guide, graduated from the university, will pick you up in front of your hotel or apartment in a private, luxury vehicle. You will then discuss with him your wishes for the tour and he will create a personalised itinerary for you, catering to your desires. 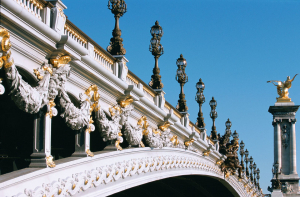 Our guide loves to take some time before starting the tour, in order to give you a complete introduction to the history of Paris and to better understand your expectations. Enjoy an hour and a half chronological visit to discover the Museum’s collections. You will first visit the medieval fortress buit in the 12th century, then the Royal Residence of the French Kings until Louis the XIV, and finally the museum which opened its doors on the 10th of August 1793. Thanks to your guide, you will skip the long lines at the Museum’s entrance and you will see all the highlights of the Louvre. This introductory tour is the best option for a first visit, since it gives you an overview of the Museum’s most famous works. Before starting the visit, your guide will qive you a complete introduction under the glass pyramid about the history of the Louvre. 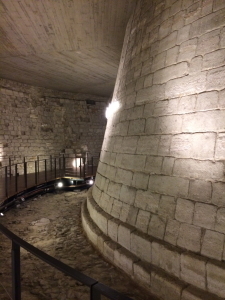 Then, you will begin your tour in the Sully Entrance with the discovery of the foundations of the Medieval Louvre discovered in 1984. More than eight hundred years ago, the French King, Philippe Auguste, ordered the construction of the Louvre stronghold on the right bank of the River Seine. The Louvre, which began life as a military fortress, was soon turned into a luxurious royal residence by King Charles V and his successors. 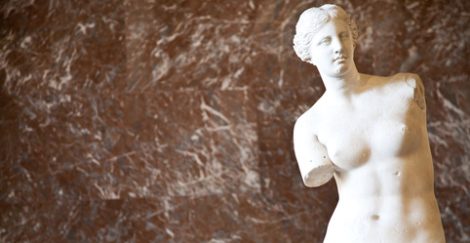 Explore the residence of the French Kings before entering the Greek section where you will see the Venus de Milo, and some original sculptures of the Parthenon. Following this, you will discover the Apollo Gallery, the Victory of Samothrace, the frescoes of Botticelli, the Wedding at Cana by Veronese, the Mona Lisa by Leonardo Da Vinci, the Coronation of Napoleon by David, the Raft of the Medusa by Géricault, the Liberty leading the People by Delacroix, the Michelangelo’s slaves and Psyche revived by Cupid’s kiss by Antonio Canova. 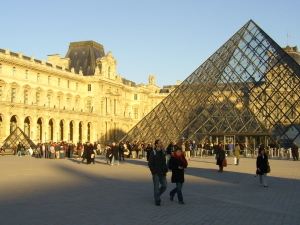 Before continuing your tour around Paris through the City Island and the Left Bank, your guide will invite you for a walk from the glass pyramid to the Tuileries Garden (designed by the first gardener of Louis the XIV, André Le-Nôtre) and he will provide all of the appropriate explanations along the way. The Tuileries and Carousel Gardens provide the perfect ambiance for a relaxing stroll. After this enjoyable stop, your guide will drive you along the Seine to reach the St Germain area (the intellectual district with its famous bookstores and Cafes) where you will have a great lunch in a typical Parisian bistro (not included). In accordance with your wishes, we will make a booking at the best place. Your guide knows all the authentic and local restaurants away from the tourist crowds, so he can best advise you with your selection. Depending on the weather, it is also possible to have a picnic in the Luxembourg garden so it will be fun for all the family. After Lunch, Discover the Best of Paris !!! Following this, you will continue your tour passing the City Island with a stop in Notre Dame, the Luxembourg Palace and the Senate, St Sulpice Church (very popular after Dan Brown‘s novel, The Da Vinci Code), The Royal Mint, The Orsay Museum (the Impressionist Headquarters ), the National Assembly (the actual House of Reprentatives), the Hotel des Invalides (where Napoleon Bonaparte is buried), the Art Primitive Museum and the Eiffel Tower (inaugurated in 1889 for the world fair). Stop at the Trocadero Square to enjoy the most beautiful view of the Eiffel Tower, before reaching the Place de l’Etoile (1st roundabout in the world) with the Arc de Triomphe (where you will see the grave of the unknown soldier), the Champs Elysées (the 2 kilometres long, most famous avenue in the world), the Elysée Palace (the official residence of the French President), the Grand and Petit Palais (built for the1900’s world fair), and the Alexander III ‘s bridge before getting back to your hotel or wherever you wish, in Paris. Tickets to the museum are not included.